John, a successful veteran professional angler from Salem, Virginia will be using a Troll Perfect on his boat during the 2013 season. While competing in the Bass Angler Sportsman Society tournaments, John has a win, and 15 top ten finishes earning him over $750,000. 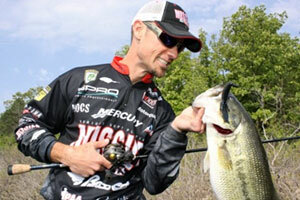 John has also qualified for seven appearances in the Bassmaster Classic (including this year's February event). "I've used the Troll Perfect product on my MotorGuide for almost 2 years and love it," explains Crews. "Its patented design is simple and enhances any trolling motor. It quiets the play between the shafts of the trolling motor, which is very important to me. The Troll Perfect also reduces the torque of the powerful motor so the direction of the motor does not shoot to one side or the other when in big waves. It is an advantage that I need to have." Perfect Outdoor Products Senior Manager Ed Laabs adds: "We are proud to have John Crews, a great fisherman, lure inventor and true gentleman, representing and promoting Troll Perfect products. We feel our Troll Perfect products can benefit all anglers, and will certainly offer John that extra advantage which will compliment his fishing skills during the 2013 tournament season". Troll Perfect is an easily installed, adjustment device that controls the torque generated by foot controlled electric trolling motors- it's available in models for both MotorGuide and Minn Kota. For more information, call: 248-747-8520, email to: trollperfect@live.com, write to: Perfect Outdoor Products, PO Box 70551, Rochester Hills, MI 48307, or visit the website: www.trollperfect.com.